From the evidence he had, Ries inferred that special markings had been adopted, common to all units defending the homeland, first a red tail band and later a blue-white-blue one. This seems to have been based on monochrome photos and (I’d guess) the memories of veterans he obtained them from, rather than on documentation. Subsequent works began to reflect a more complicated picture and the revelation that each Jagdgeschwader was allocated a colour/combination of its own came, so far as I remember, in Thomas H. Hitchcock’s Messerschmitt ’09 Gallery (Monogram, 1973). In 1992, I made a much smaller contribution in the form of a short paper for the Luftwaffe Circle (a pre-internet group convened by Dr. Jim Kitchens). I think this was the first publication of camouflage and markings information derived from ULTRA and it showed, amongst other things, that JG 11 ordered the application of fuselage bands on 24 December 1944 with JG 53 following suit four days later. NOTE: All of that paper’s ULTRA material and more is now on this site. The fullest discussion of the whole issue that I know of can be found in Ken Merrick’s Luftwaffe Camouflage and Markings, 1933-1945, Volume 2 (Classic Publications, 2005). 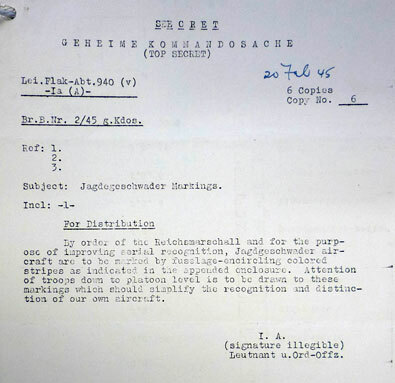 He reproduces (in translation) the texts of relevant documents, among them the supposed directive of 20 February 1945 allocating identification bands to all of the extant Jagdgeschwader bar JG 400. Merrick does not specify his source for this document and neither (in a 1997 reference article for Hyperscale) does David E. Brown, although the latter does reproduce some of the header information as well as the translated body of the text. Merrick incidentally uses the English spelling “coloured” while Brown opts for the original American, “colored.” That suggests to me that Brown’s source was report No. 48/1945 of the US 9th AF's Air Prisoner of War Interrogation Unit (see below). The order was accompanied by an explanatory diagram. 1. The original is likely to have fallen into American hands in the first days of March as US troops closed up to the west bank of the Rhine. 2. The document was issued to (or perhaps by?) a Flak battalion based on the Central Rhine sector near Koblenz very early in 1945. This seems confirmed by the reference “Nr. 2/45”: such a low serial number seems inconsistent with something issued seven weeks into the year. 3. This is the sixth of six copies, suggesting that a local command was notifying its subordinate units of the changes; it does not come straight from OKL and so there is likely to have been a time lag between the original order and the distribution of this copy. 4. Crucially, the translated document has been printed in black while the date “20 Feb 45” has been handwritten in blue ink. There is thus no firm basis to suppose that this was the date of the original order from OKL. The document was submitted to this unit by the G-2 Documents Section, 12th Army Group and there is no information available as to details of capture.